Monday April 21st 1890 We washed this forenoon. The incubator is hatching very well indeed. Mother went to town in the afternoon and did not get home till supper was ready. I went over to Marys awhile and she and the girls came home with me to see the little chickens. Will was busy about home most of the day. [the following text is written vetrically in the right margin of the above entry] Mrs Crouley is dead. Tuesday April 22nd 1890 We got the ironing done before noon. "Nell" had a colt this morning when we got up but it was not very strong. Mother went to town in the afternoon and I went over and Mary and I went down to Crouleys a few moments. I came home about four oclock and took came of my chickens. Will helped me and I set the incubator again tonight. It was so rainy that Mother did not come home tonight. Wednesday April 23rd 1890 I fixed a coop and brought part of the chickens of this morning. Mother got home in time to help me with the dinner. The colt died today. Will worked out in the garden in the afternoon and we were all out there raking and helping him burn the trash. him and I rode to town in the evening. Thursday April 24th 1890 We got our work done up early. Fanny, Ott and Mrs Bremmer were here for dinner. We had our last turkey. In the afternoon Hatt and Mary with both the girls were over so We had a famous visit. Will was obliged to go to the West farm with the carpenter to finish the work on the house. Friday April 25th 1890 I did some sweeping and cleaning this morning. Mother went to town and did not get home till after the Theater in the evening. Will went to the valley for a load of oats, and in the afternoon I helped him measure the garden fence. "Flora" has a nice strong colt. I sewed a little in afternoon and evening. 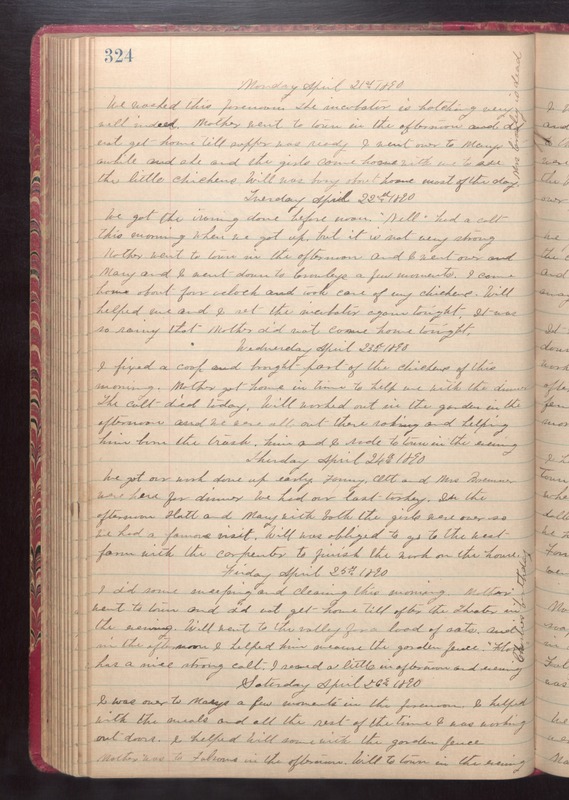 Saturday April 26th 1890 I was over to Marys a few moments in the forenoon. I helped with the means and all the rest of the time I was working out doors. I helped Will some with the garden fence. Mother was to Folsoms in the afternoon. Will to town in the evening.